In 2018, Living and Learning Design Center (LLDC), India's first craft museum by the Shrujan Trust located near Ajrakpur village, 16 kms from Bhuj, Kutch debuted its craft festival showcasing embroidery styles unique to 12 Kutch communities and the indigenous arts and crafts of the region. From January 19 to January 23, LLDC in collaboration with the North East Zone Cultural Center (NEZCC) and the West Zone Cultural Centre (WZCC) will host the folk festival, Namaste, a showcase of arts, crafts, food and dances from the Kutch region as well as the North Eastern states. Explaining the coming together of the West and East in this festival, Ami Shroff, Managing Trustee at Shrujan Trust says,The Namaste Festival took place recently in Mumbai and in conversation with the organizers we realized that most people in the country don't seem to know much about the extreme east and west of the nation. The idea is to bring these far flung places close to us through this festival. To bring a festival of this magnitude together requires collective work. The LLDC has worked alongside the tourism departments of the North East as well as the West, which covers Gujarat and Rajasthan. Speaking on the similarities between these two regions and their art forms, Ami explains that though the weaving methods of the North East and Kutch are different, one finds similar motifs and design patterns. Woodwork is a common art- while in Kutch it is lacquer work, in the North East, you find cane and bamboo work. And contrary to popular belief, there are a wide range of delicacies from the North East that are completely vegetarian and which will be showcased at the festival. There is a lot to look forward to at the Namaste festival this year. The craft, snacks and demonstration stalls open at 4PM each evening. Crafts such as Lacquer work, Rogan Art, Cane and Bamboo crafts, Kauna as well as Assamese and Naga handloom will be on display from the North East. Kutchi crafts will include wood carving, patch work, metal crafts, block printing, weaving, bandhini and more. There will be stalls were visitors can try their hands at some of these art forms. Of course, there is a lot of handicrafts that can also be purchased. Children will have unique play areas which will include Rajasthani Puppeteers, the Kutchi Ghodi Dance, and a range of displays at the museum galleries, fossil exhibitions as well as the chance to get hands-on with some of the crafts with some artisans. Each day's performances begin a little later in the evening. 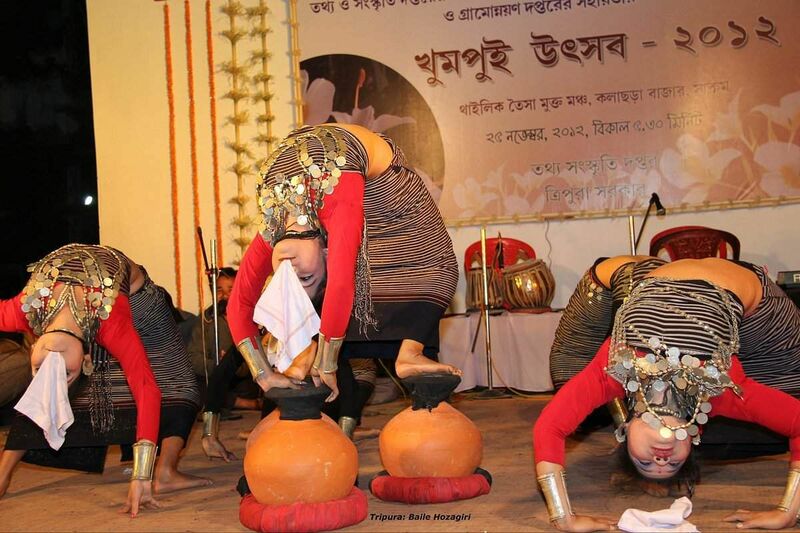 They will open and close with Kutchi performances and feature acts from the North East as well. A mix of folk music as well as traditional dances from both regions will be performed each evening. Interestingly, no performance will be repeated. Visitors can also pick up coupons for dinner thalis showcasing the Assam, Manipur and Kutch. Shroff adds that with this festival LLDC's primary aim is of familiarizing the local people with their own culture as well and that of others.In fact,she says,all the visiting artistes will be put up in local homes so that they truly get to live and experience our culture. We wanted it to be an immersive experience for all. Tickets to Namaste are priced at a modest Rs 50 and will give one access to all areas of the festival. 1) Folk music performance by the Muralala Marwada Group. 1) Some Assamese specialties to look forward to are the Joha and Bora rice, the Black Dal with Elephant Apple and alternately Bamboo shoots, the Pakoras with a special medicinal leaf, and desserts such as Pitha and Khir. 2) From Manipur, you will get to try their rendition of the Arhar Dal called Hawai Orhon, the Maroi Thongba, Green Chive fried with groundnuts and roasted black gram balls, the Koukha Kang-hou (fried field tubers), Heikru-morok, a local pickle of gooseberry and desserts like the Chaak-hao kher (purple rice kheer) and the Khamen-asinba thongba (tomato jelly). 3) From Kutch, you have the Odo (baingan bharta), the Sev tamatar nu shaak, the Dungdi Gaathiya nu shaak, kadhi, and khichdi and dahi tikhaari among other dishes. Visitors can also pre-book unlimited thali dinners at Rs.200.These vegetarian thalis will showcase the best of Assam, Manipur and Kutch.Each day will have a different mix of dishes.